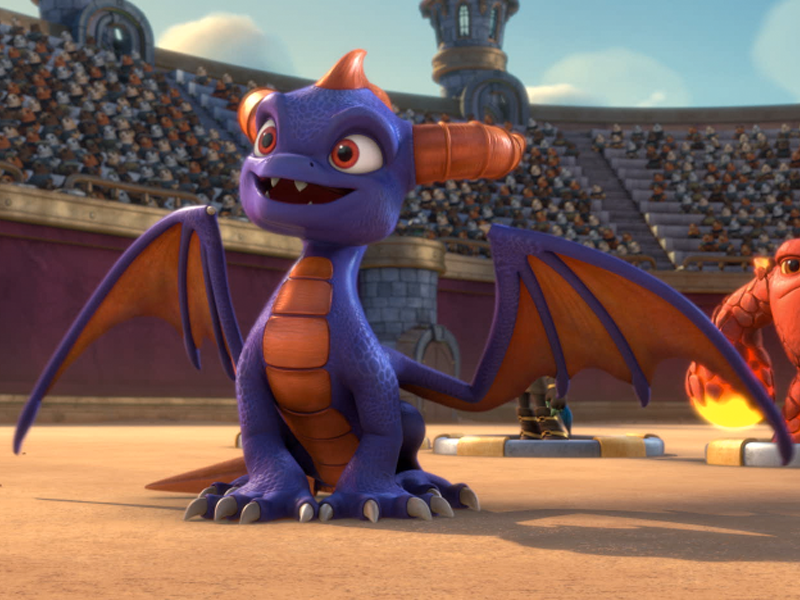 Spyro (left, voiced by Justin Long) and Eruptor (Jonathan Banks) at the Skylander Games. Portal masters rejoice! Your favorite Skylanders are heading to the television screen in “Skylanders Academy,” the highly anticipated, animated action adventure series based on the wildly popular Skylanders franchise. The first production from Activision Blizzard Studios’ announced it received a two season order from Netflix with an anticipated Fall 2016 premiere date. The show has something for everyone – existing fans, new audiences, children, young adults and parents – with a slew of talented voices including that of Ashley Tisdale, Justin Long, Parker Posey, Susan Sarandon, and of course, Richard Horvitz as the evil Kaos. The award-winning Skylanders franchise, created by Toys for Bob, has become the 11th best-selling console videogame of all time, generating more than $3 billion in retail sales worldwide with more than 250 million toys sold worldwide. Earlier this month, we revealed the newest game in the franchise – Skylanders Imaginators, which allows portal masters to dig deep into their imagination and create their very own Skylanders from head to toe. Launching October 16, 2016, the game will also feature special guest star Crash Bandicoot, who joins the Skylanders Imaginators in a battle to defeat Kaos’ doomlanders. Activision Blizzard, Inc. (Nasdaq: ATVI) announced that “Skylanders Academy,” the first production by Activision Blizzard Studios—its newly-created television and film studio—will premiere in Fall 2016 on Netflix, the world’s leading internet television network. Over the last five years, millions of families around the world have welcomed Skylanders® characters into their homes. Now, they’ll be able to watch their favorite characters come to life on Netflix,” said Bobby Kotick, Chief Executive Officer of Activision Blizzard. “We couldn’t have found a better home for ‘Skylanders Academy’ and look forward to sharing our extraordinary characters with Netflix audiences around the world. ‘Skylanders Academy’ gives us the opportunity to approach narrative storytelling with the same level of quality and excellence that millions of Skylanders fans have come to expect from the game,” said Activision Blizzard Studios Co-President Stacey Sher. “We’re inspired by our fans’ excitement for these characters and have worked hard to bring these characters to life with stories our fans will love. Do you have any Skylanders’ fans in your house? Comment below and share with us!